South African Bulk Terminal (SABT), a major customer of Bu¨hler located in Durban, South Africa, in 2005 decided to invest in a large overhaul of its first grain import terminal in the port of Durban, DBS, writes Vincent van der Wijk, Product Manager, Bu¨hler. At the time, not only the existing silo has been upgraded, but SABT has also invested in a state-of-the-art mechanical ship unloader, the Portalink 800 from Bu¨hler, which was successfully commissioned in 2006. Since 2006, SABT has been using the Portalink continuously over the years and has during that time unloaded more than 20mt (million tonnes) with constant high and reliable unloading capacity. SABT, at its second grain terminal, RBS, is currently undertaking an extensive plan to upgrade not only the silo installation, but also install a new unloader and loader. Based on the excellent experiences with the mechanical unloader from Bu¨hler installed already at the first site of SABT and the long-term relationship between the two companies, Bu¨hler was the logical choice for the new investment. To be ready for the future enabling larger vessels to be unloaded at the DBS site, both the mechanical unloader Portalink and the loader mobile Portaload are capable of handling vessels up to 80,000dwt. The Portalink, having a nominal unloading capacity of 800tph (tonnes per hour), in line with the previously installed Portalink at the first location of SABT. The mobile Portaload has a nominal loading capacity of 1,000tph. The additional capacity is enabling SABT with its strategic location in Durban to be an important role player in grain imports and export in the port of Durban. The main technical reasons for SABT to invest both times in the mechanical unloader from Bu¨hler are the low energy costs per unloaded tonne, which are between 0.35 and 0.4 kWh per unloaded tonne, but also the low maintenance costs. Especially important for the operation and consequent efficiency of the unloader is the ease of operating the unloading installation. With the experiences gained by SABT with the first Portalink, confidence in high efficiency unloading through the use of the automatic sink-in function has been placed. SABT not only chose Bu¨hler for its strong reputation in the market regarding equipment, but also because it has great confidence in the professional project management executed by Bu¨hler, and the expert knowledge to complete complex projects and “get it done”. SABT is also placing great value and trust on the long history of Bu¨hler as a competent partner with good after-sales service. One example regarding the excellent knowledge during the project management has been the assembly concept. SABT has continued to use the existing equipment on the quay and requested minimum downtime for on-site installation. In addition, the quay on which the loader and unloader have been installed is standing in the water with two access points. Bu¨hler, together with SABT, has made an assembly concept by which the main components have been assembled at a site in the Port of Durban in large parts specially divided on the maximum weight of available cranes. After pre-assembly in the Port of Durban, the Portalink has been assembled on site after being transported by floating crane, followed by the Portaload. With this option, an optimal combination from on-site installation and total costs has been achieved. To enable optimal working conditions for the operating crew of SABT, both the Portalink and Portaload have been equipped with an operating cabin in addition to the remote control. The operating cabin enables the operator to have full control and information about not only the installation but also the loading or unloading procedure in a secure and strategic place through which a complete overview of the quay is given. To improve even further the view of the operator, the Portalink is additionally equipped with cameras having a 360° view received of the end of the horizontal boom. With the energy costs rising, and environmental regulations getting more strict every year. The existing loader without specialized loading head emits considerable amounts of dust during loading operations. This is not only to detriment of the direct surroundings, but it also means that valuable cargo is blown out into the air. With this upgrade, SABT has invested in the dust suppressor of Bu¨hler enabling loading with minimal dust emission, or to quote Managing Director, Mr Lourens “the dust suppressor works damn well”. some 10,600 employees worldwide. In fiscal year 2014, the Group generated sales revenue of CHF 2.3 billion. Neuero Industrietechnik fu¨r Fo¨rderanlagen GmbH, based in Melle, Germany, offers turnkey solutions for bulk material handling. A major part of its portfolio relates to CSUs (continuous ship unloaders). All Neuero equipment is manufactured according to the ‘Made in Germany’ tradition, ensuring high quality, environmentally friendly and durable loading and unloading equipment for industrial plants, silo terminals, power plants, aluminium smelters, malting plants, feed mills, etc. Follows details of some of the most popular CSU types produced by Neuero. On all of these models,ATEX directives are supported and explosion protected equipment is used. The use of the latest blower technology with additional equipment for sound absorption is supplied, also taking into account local regulations. Another facet that is common to all the models below is the suction nozzle. This is characterized by an automatic electrical air bypass control which makes it possible to adapt the discharge power perfectly to the geometric conditions, the conveying product and the environmental conditions. In addition, an automatic nozzle dipping device can be delivered. This controls the depth of immersion of the nozzle in response to the vacuum, thus ensuring a continuous operation with high average capacity. The auxiliary winch on the boom of the CSUs is very popular. With this winch, a small front-end loader (e.g. Bobcat) or larger excavators with up to 15 tonnes in weight can be lifted into the ship’s hold to support the cleaning operation. The winch works at two speeds and is secured via load measuring axles. consideration of the ATEX regulations; and v easy access with low maintenance. Neuero’s Tower CSUs are especially used in the aluminium industry or in bigger grain terminals. They travel on rails and are equipped with two separate pneumatic conveying lines each covering for 50% of the total capacity. The design of the Tower allows for the integration of various conveying elements such as hopper scales and additional ship, truck or rail car loading equipment. As a separate winch is mounted on each boom, the unloading operation does not have to be completely interrupted when lowering a front-end loader, such as a Bobcat, into the hold — operations can continue with the second boom. easy access with low maintenance. The Flexiport’s unloading operation is carried out with a pneumatic suction conveying system with a vertical and horizontal conveying pipe incorporated in a slewable and liftable boom. This allows for the unloading of non-free flowing materials. The unloading suction line is equipped with a feeding system at the inlet, feeding the material to the suction nozzle. This mechanical reclaim system consists of a electrical rotating feeder, which loosens the material and feeds it to the suction nozzle. The Flexiport can be used in particular for the discharge of bulk materials like soy meal, corn gluten, fish meal, feed pellets, wood pellets, etc. Unloading of all kinds of inland or ocean-going vessels with discharge directly onto conveyors, trucks or rail cars. This happens almost dust-free through the use of closed conveying systems and aspiration systems. Flexiport unloaders have discharge capacities of up to 600tph based on wheat. By Kick-movements of the rigid vertical boom it can reach any place inside the hatch and even below ship covers. including a special clean up nozzle for the feeder. The Multiport is suitable for discharge of many kinds of bulk materials especially from the food sector but also for products from the power plant and aluminium industries. These systems are usually customized developments and adapt to the existing geometric conditions. Unloading of all types of inland or ocean-going vessels and discharging directly onto conveyors, trucks or wagons. This happens almost dust free through the use of closed conveyor and aspiration systems. Multiport ship unloaders have, depending on the geometry, bulk discharge capacities of up to 800tph based on wheat, with an energy consumption of 1.0kW per discharged tonne. They are powered either directly by low voltage or medium voltage with on-board transformers to get the corresponding voltages. If this is not possible, diesel generators can be used. Such type of machines are usually equipped with their own rubber-tyred chassis, which makes it possible to use the unloader at different locations in the port. With the use of horizontal and vertical telescopic pipes a large surface can be reached within the ship’s hatches. With a so-called auxiliary winch on the boom, a small front-end loader (e.g. Bobcat) or larger chain excavator with up to 15.0 tonnes in weight are lifted into the ship’s hold for cleaning operation. the air and thus cleans the filter bags via an integrated nozzle system. Moisture condensation is prevented in the filter media and the use of a compressor is not necessary. Emission levels below 20mg/Nm3 are easily achieved. Special explosion-protection concepts can be developed and in the event of an explosion special equipment can be supplied to prevent penetration of flames in both directions. The ability to lower the boom to the ground offers a special advantage in maintenance and possible replacement of individual parts, e.g. wear plates in the elbow, cable for winches, pulleys, etc. In consequence work at height — sometimes dangerous — can be avoided. With the auxiliary winch on the boom, a small front-end loader (e.g. Bobcat) or larger chain excavators with up to 15 tonnes in weight can be lifted into the ship’s hold to support the cleaning operation. The winch works at two speeds and is secured via load measuring axles. The COMBIPORT is suitable to discharge many kinds of bulk materials especially from the food sector but as well as bulk materials from the power or aluminium industries. These systems are usually customized developments and adapt to the existing local conditions. Unloading of all type of inland or ocean-going vessels and discharging directly onto conveyors, trucks or wagons. The loading operation take place most of the time with smaller ship sizes. This occurs almost dust free through the use of closed conveyors and aspiration systems. COMBIPORT ship unloaders have, depending on the design, bulk discharge capacities of up to 800tph based on wheat, with an energy consumption of much less than 1.0kW per discharged tonne. They are powered either directly by low voltage or medium voltage with on-board transformers to produce corresponding voltages. If this is not possible, diesel generators are used. With the use of horizontal and vertical telescopic pipes a big surface can be covered within the ship’s hatches. With a so- called auxiliary winch on the boom, a small front-end loader (e.g. Bobcat) or larger chain excavator with up to 15.0 tonnes in weight are lifted into the ship’s hold for cleaning operation. The COMBIPORT ship unloader is equipped with the latest filter technology. The main filter with the special filter cleaning system has proven to be the best while simple and maintenance free. A purge air fan draws the air from the clean gas chamber of the filter, compresses the air and thus cleans the filter bags via an integrated nozzle system. Moisture condensation is prevented in the filter media and the use of a compressor is not necessary. Emission levels below 20mg/Nm3 are easily achieved. Special explosion protection concepts can be developed and in the event of an explosion special equipment can be supplied to prevent penetration of flames in both directions. Siwertell, part of Cargotec, secured a second order for a road- mobile ship unloader from Russian company PSR Primstroyresource, based in Vladivostok. The latest contract is for a next-generation, diesel- powered, trailer-based Siwertell 10 000 S unloader, fitted with a double bellows system and dust filter. It will be used to unload cement on the Island of Sakhalin at a rated capacity of 300tph (tonnes per hour). The order was received in September 2015 and the delivery is planned for March 2016. “Siwertell received this order with great pride and considers it an acknowledgement of the success of PSR’s previous delivery,” says Jo¨rgen Ojeda, Director, Siwertell Mobile Unloaders. “Siwertell’s road-mobile unloaders were originally developed for handling cement, and so are ideally suited to this commodity. “Our road-mobile unloaders are among the most reliable and environmentally friendly systems available for cement- handling operations. As there is no need for any preparatory civil engineering works, they can commence operations as soon as they arrive on site. In 2009, PSR needed an unloader to discharge cement directly into trucks and train wagons at a city centre location. Therefore quiet, dust-free operations were essential and it identified a Siwertell 5 000 S road-mobile unloader as the ideal solution. The new unit has all the well proven attributes of PSR’s first unloader. However as one of the ‘New Generation’ units it benefits from a number of advances including a major upgrade of the hydraulic system, completely new and future- proof electrical system, PLC control system and radio equipment, and upgraded EBS system on trailer. Siwertell ship unloaders and loaders are based on unique screw conveyor technology, in combination with belt conveyors and aeroslides, and can handle virtually any dry bulk cargo, such as alumina, biomass, cement, coal, fertilizers, grain and sulphur. Siwertell’s product portfolio includes ship unloaders, mobile ship unloaders, shiploaders, conveying systems and complete bulk terminal solutions, all of which are designed to ensure environmentally-friendly and efficient cargo operations. Siwertell is part of Cargotec. Cargotec’s sales totalled approximately €3.4 billion in 2014 and it employs approximately 11,000 people. Cargotec’s class B shares are quoted on NASDAQ OMX Helsinki Ltd under symbol CGCBV. Unlike the minerals and mining sectors, where capacity investments are currently reduced because of the sharp drop in commodity prices, investment in grain activities remains buoyant so far. It is estimated that 600mt (million tonnes) of grains, seeds and cereals are moved by sea every year. The top three bulk products included in these commodities are wheat, corn and soyabeans, year after year. Will this investment trend continue in 2016? the continuing investment in high-capacity unloaders and grain terminals in importing countries. Public authorities have apparently grasped the concept that using a small 1,250dwt barge to transport commodities removes 60 trucks from the roads. Road congestion is increasing all over Western Europe; in addition to high fuel costs, other factors to consider include CO2 emissions and the risk of road accidents. It is therefore no surprise that wheat and corn are increasingly transported by barge. Unfortunately, public financial incentives are still to low to really fix this trend. VIGAN has recently sold unloaders dedicated to handling river barges in its home country of Belgium (Albert Maltings of Heineken Group, Dossche Mills, Cargill in Ghent), as well as in Dunkerque and Rouen in France, in Hamburg Germany and in Switzerland on the Rhine river. For this range of unloaders, VIGAN is focusing its continuous investment in R&D on reducing power consumption. Pneumatic ship-unloaders are already known as the most efficient for unloading barges (i.e. the quickest to empty a vessel);VIGAN’s unloaders are combining this positive element with a power consumption not higher than 0.6KWh per tonne. In this case, there is no need for high capacity unloaders when barges are only 250dwt to 3,000dwt. Industrials are focusing more on reliability and total cost of ownership than high capacity. 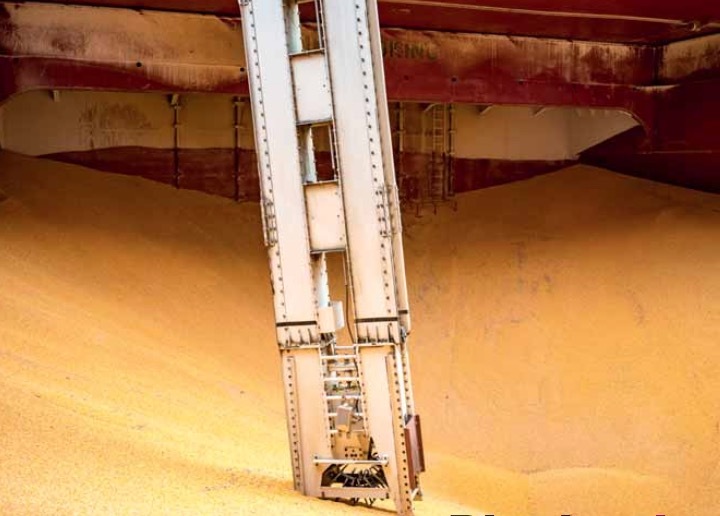 Overseas, large importing countries are still the main investors for the grain ship-unloaders, and VIGAN naturally sees a higher demand for machines with higher capacities to unload increasingly large vessels. Next to the traditional markets of Algeria, Saudi Arabia, Iran and so forth,VIGAN has just commissioned a second NIV 600tph in Taiwan. VIGAN is present in the main two ports of the island, Kaoshiung and Taichung, and is the loyal supplier to EMI, the largest grain importer of the country. This is yet another example of high capacity unloaders for large importers. There are fears however that, in the coming years, oil exporting countries — some of which are also the traditional grain importers — might reduce their global budget for investment due to lower oil revenues. Equipment offering the best mix of ‘quality-price-efficiency’ will remain attractive. Customers require long-term reliability and a strong after- sales service. VIGAN fits those needs: the company offers full service with the projects it carries out, from initial drawings rights up to the manufacture and installation of its machines. Its NIV pneumatic unloaders have been shown to be reliable for more than 30 years, and VIGAN offers a continuous after sales service. There is no better reward than receiving a new order from an existing customer that wants to increase capacity or to equip another site. VIGAN plans to continue working, and looks forward to what 2016 will bring. TAKRAF Tenova has recently and successfully accomplished the performance tests on the CSU (continuous ship unloader) for iron ore and coal installed in Taranto Iron & Steel Plant, Italy. This plant is the largest of its kind in Europe. The turnkey contract — awarded in September 2013 — came after constant dialogue between TAKRAF Tenova and ILVA S.p.A., the leading Italian steel producer, and was built on a long-standing business association with this prestigious customer of 40 plus years. The new CSU has been designed to have an operating capacity of 4,000tph (tonnes per hour) for iron ore and 2,240tph for coal and is able to unload vessels of up to 150,000dwt. The CSU has been erected on the existing runways of the ILVA plant’s Pier II to feed, together with the other machines at the plant, the entire steel plant with coal and iron ore and pellets. The CSU has been almost entirely manufactured by Italian companies. During November last year, TAKRAF Tenova successfully ran the performance tests on both materials, greatly exceeding the contractual parameters. Only a few companies in the world are able to supply this type of technology and TAKRAF Tenova offers many successful references since, to date; 16 CSUs have been supplied worldwide. TAKRAF Tenova developed the bucket chain CSU technology in the 1980s and subsequent years have seen ongoing enhancements to the technology, with the most sophisticated part being the digging foot for which the company holds the patent. Modern bucket chain CSU significantly reduce dust emission during the unloading cycle and is for this reason that ILVA — which in recent years has initiated a plan for the environmental rehabilitation of the steel industry in Taranto, very close to the city area — chose TAKRAF Tenova as a reliable partner at this stage of the plan: the CSU’s low environmental impact was in fact a major deciding factor. In addition to the ability to design these kinds of equipment, the company philosophy also aims to support its clients after handover and, upon request,TAKRAF Tenova team is able to give technical assistance both for maintenance and service on an ongoing basis. A fine illustration of this approach is the two service contracts awarded by the leading Italian power generation company, ENEL S.p.A., for the four bucket chain CSUs, previously supplied by TAKRAF Tenova, and located respectively at Civitavecchia and Brindisi to feed coal to two of the largest power plants in Italy. Both contracts are 24-month duration extensions of previous contracts. Following this experience, ILVA decided to award TAKRAF Tenova with the maintenance contract for the CSU that has just been delivered. TAKRAF Tenova is a key supplier of equipment and systems for open pit mining and underground solutions and bulk handling, having provided hundreds of complete systems, as well as individual machines to clients all over the world in all climatic conditions. Leading-edge comminution systems for milling and crushing requirements in mining and mineral processing are based on a track record in mill supply dating back to the 1920s. Globally sourced air pollution control, specialized handling equipment, and technology for the cement and fly ash industries ensure selection of optimal processing options. Tenova Mining is a total integrated solutions provider to the global mining, bulk materials handling and minerals beneficiation and processing sectors, offering innovative technological solutions and full process and commodity knowledge across the mining industry value chain. Tenova is a worldwide supplier of advanced technologies, products, and engineering services for the metals and mining & minerals industries. ThyssenKrupp Industrial Solutions AG, BU Resource Technologies (TKRT, formerly ThyssenKrupp Fo¨rdertechnik), one of the world’s leading companies in the field of bulk materials handling equipment and systems, is active in the design, manufacture, installation and commissioning of complete materials handling equipment and systems, as well as individual machines, such as stackers, reclaimers, shiploaders, ship-unloaders and wagon tipplers, crushing and screening equipment and opencast mining plant and systems. Recently, the company’s Bulk Materials Handling Business Unit based at Rohrbach in Germany has experienced considerable success with the award of new contracts and the construction of individual machines for continuous barge unloading facilities. Some examples of machines recently installed or currently in design or under construction as well as the new development of continuous ship-unloading technology are described in the following article. 2012 is the year for Indonesian CBU, besides the installation of a CBU at Bontang, another order was received for a 3,000tph (tonnes per hour) continuous barge unloader (CBU) for coal; destined for Kalimantan on Borneo. It will be the third CBU operating in Indonesia, designed and built by TKF. The Arutmin North Pulau Laut Coal Terminal, PT Nusa Tambang Pratama, a company of the well-known Bakrie Group, recently placed the order with TKF. One deciding factor for this decision was, amongst others,TKFs’ excellent track record of more that 50 continuous ship and barge unloaders in operation worldwide; some of these have been in service for more than 25 years. practically superfluous, are a special advantage of the TKF type of continuous barge unloader. TKRT, Business Unit Materials Handling, better known in former days as PHB or PWH, first developed the bucket elevator type of continuous ship unloader (CSU) at the beginning of the 1970s. Its first CSU, designed to unload asbestos, was commissioned in 1974. It took some years before customers, who until then had been working with conventional grab-type ship unloaders, saw the advantages of a CSU compared with the conventional grab type used mostly in those days. Since then however, the TKF type of CSU has made its mark in the field of dry bulk ship unloading. Today TKRT CSUs are designed for handling such products as coal, iron ore, phosphate, urea, sand unloading bulk carriers of up to 250,000dwt. In recent years, in particular in countries which depend heavily on importing their fossil fuels, coal fired power plants are invariably built directly at deep water sea locations with the convenience of having their own coal unloading terminal facilities. Two such coal-fired power plants for example, are the Tanjung Bin and Jimah power stations in Malaysia. Here four TKF CSUs are in operation. Another prime example is the Hou Shi Power Plant in Fujian Province, P.R.of China, where three TKF CSUs are in operation. However, also large coal import terminals, for example in China, have in the last ten years turned more and more to using CSUs. To date, TKF has already supplied in total 15 CSUs to China. In South Korea there are already nine TKF-designed CSUs in operation in coal-fired power plants. In 2012, the Zhu Jiang Power Plant began the expansion project of Phase II for the other 1,000MW block. For that expansion, and in favour of the environmental protection and high unloading efficiency, the client placed an order to TKRT for two chain bucket elevator CSUs. The contract was awarded in June 2012 for the supply and installation of two CSUs. These unloaders were designed for an unloading rate of 1,500–1,650tph, with ship sizes up to 70,000dwt, and in the future for 100,000dwt representing outstanding success of TKF in China by covering >75% of market share. Since April 2014 these two CSUs have been operating successfully for coal unloading. Further to this success story,TKRT won a new contract through an international tender for the new chain bucket elevator CSU, for the power plant development of Baolihua New Energy Co. Ltd. Of Guangdong, China. The order was placed in September 2015. This CSU will be designed for an unloading rate of 2,000–2,200tph and ship sizes up to 100,000dwt representing the third-largest CSU for coal in China, while the others supplied to Huayang PP in China in 2007 and Huilai PP in China in 2010. For ThyssenKrupp, this follow-up order not only means being awarded a further order, but also represents continuity with respect to design, supply, construction and management and demonstrates the client’s appreciation of and satisfaction with TKF’s performance to date. The delivery to site and commissioning of the new CSU is schedule for April 2017. Commercial operations can start from June 2017. With this contract,TKRT, one of the world’s leading designers and manufacturers of CSUs, has once again contributed to the development of China’s coal ports and power plants along with other equipment of more than 60 machines for car dumpers, ship unloaders, shiploaders, stacker- reclaimers, etc.